Antelopes are a diverse group of typically hollow-horned, slender-built, and swift bovids native to Africa and Asia. Antelope species do not form a taxonomic group but are spread throughout the subfamilies of the Bovidae family (bovids) of the order Artiodactyla (even-toed ungulates); many are more closely related to cattle or goats than to each other. There are over 80 species of antelope, ranging in size from the royal antelope, which weighs about 3.5 kg (8 lbs), to the giant eland, up to 900 kg (2,000 lbs). Antelopes are generally characterized by a light, elegant figure, graceful limbs, small cloven hoofs, a short tail, and large and unbranched horns, which may be spiral-shaped. Some species have horns that are small. Antelopes pay key roles in ecosystems as part of the food chain, consuming plant matter and in turn being prey for a variety of animals, including lions, pythons, crocodiles, baboons, and jackals. Their beauty, grace, speed, agility, and unique movements (bouncing up and down on all four outstretched legs when alarmed) make them attractive for viewing by humans, who also have historically hunted them for food and sport. However, various anthropogenic factors (overhunting, habitat removal, introduced diseases) have reduced some species to endangered statuses. The pronghorn of North America is often called an antelope. 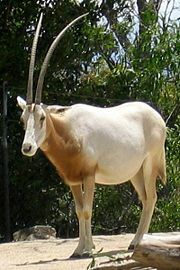 Although it is very antelope-like, it is not a true antelope since it is not a member of the Bovidae family. The greatest number of antelope species is found in Africa, where they live throughout the continent. A few are found in southwest Asia, in India, and in central Asia. Most species live in grasslands, or in savannas, mixed forest, and grassland. Some, mostly the smaller species, live in dense tropical forests and others live in deserts, marshlands, and mountainous areas (Bere 1970). All antelopes have long, slender legs and powerful muscles where the upper legs meet the body, providing leverage and increasing leg stride and speed. Antelopes are fast runners, although they are not the fastest animals in the world. They are good at quick, precise turns, and they can run very fast for extended periods of time. This gives them an advantage over many predators, such as the cheetah, which relies on sprinting and can be tired out by the antelope's greater stamina. Antelopes bear a dense coat with short fur. Most antelopes have fawn or brown-colored fur, which makes them harder to see. There are some exceptions, including the rare zebra duiker, which has dark vertical stripes, and the gemsbok, which has gray and black fur and a vivid black-and-white face. A common feature of the gazelle is a white rump, which flashes a warning to others when it runs from danger. 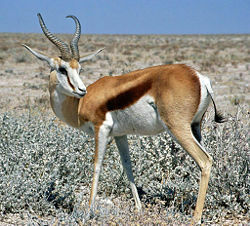 One species of gazelle, the springbok, also has a pouch of white brushlike hairs running along its back. When a springbok senses danger, its pouch opens up, and the hairs stand on end. Antelopes are ruminants. Like other ruminants, such as cattle, goats, and sheep, they have well-developed cheek teeth or molars, which grind cud into a pulp. They have no upper incisors or canines; in order to tear grass stems and leaves, their lower incisors press against a hard upper gum pad when they bite. Antelopes rely on their keen senses to avoid predators. The word "antelope" comes from a Greek word meaning "brightness of eye." Their eyes are on the sides of their heads, and their pupils are elongated horizontally, giving them a broad view of danger from both the back and front. Their senses of smell and hearing are also acute, giving them the ability to perceive danger while out in the open where predators often prowl after dark. Both sexes of most antelope species grow horns, with the males' horns generally larger. The dik-dik and klipspringer, two species where the male mates with only one female, have horns that are little more than spikes. However, in species where males compete to mate with several females, horns may grow as long as 1.5 m (5 ft). Despite their large size, antelope horns are hollow and lightweight. Antelope horns are almost always slightly curved, although in some species, such as the blackbuck, they are spiraled. In many species, the males are larger than the females. 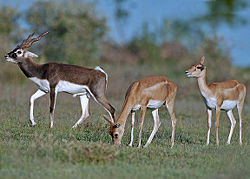 In several species, such as the blackbuck, males and females also differ in color. Almost all antelopes are social animals, living in groups called herds. They communicate with each other using a varied array of sounds. 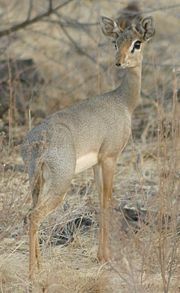 For example, dik-diks whistle when alarmed, warning animals of other species of the danger as well. Generally, though, sight is a much more common form of communication than sound among antelopes. An antelope's mood is indicated by its posture and movement. When excited or alarmed, most medium-sized species of antelope bounce up and down on all four legs, keeping them stretched out straight. This behavior, known as pronking or stotting, acts as an alarming display. 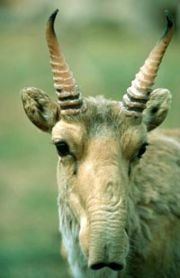 Some biologists theorize that stotting also sends a message to predators, showing that individual antelopes are fit and alert, and therefore not worth pursuing. Antelopes also use scent signals to communicate; these signals can linger for many days. Antelopes that live in herds have glands in their hoofs that leave a scented record of their movement. If an antelope were to be accidentally separated from its herd, it would be able to follow the scent tracks back. Species of forest, woodland, or bush tend to be sedentary, but many of the plains species undertake huge migrations. 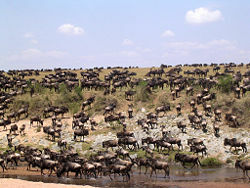 These migrations enable grass-eating species to follow the rains and therefore their food supply. The wildebeests (also called gnus) and gazelles of East Africa perform some of the most impressive mass migratory circuits of all mammals. Also impressive is the migration of the saigas over the steppes (grasslands) of Russia and the Ukraine. These antelope were hunted almost to extinction by the early twentieth century but have recovered and are now seen in herds numbering in the hundreds of thousands (Nowak 1983; Huffman 2007). Antelopes are preyed upon by a variety of predators; a study in Kenya listed lions, leopards, cheetahs, African wild dogs, pythons, crocodiles, baboons, jackals, and secretary birds. Newborn babies are the most common victims, followed by old, sick, or injured animals. Among adult antelope, males are the victims more often than females, partly because they sometimes stand to face the predator letting the females and young escape and partly because their horns slow them down and make them easier targets (Bere 1970). The response of most antelopes is to run away as soon as the predator is detected inside of what is known as their "flight distance": this the distance that they would need to give them an advantage in outrunning the predator. It varies depending on the kind of predator; longer for a cheetah than a slower lion, for instance. Only a few antelope species are in the habit of fighting back against predators. Those that do are some of the larger species; including the oryxes, whose horns are very effective weapons (Voelker 1986). From earliest times, antelopes have been hunted by humans. In the Middle East, gazelles provided the most important source of meat at the time that sheep and goats were being domesticated, about 10,000 years ago (Clutton-Brook 1999). Antelope have also been hunted for sport. Antelope hunting scenes are often seen in ancient art. Some species of antelope have become extinct and others have been driven out of parts of their past ranges due to overhunting. Today, a number of species are endangered, mainly because of hunting, introduced diseases, and loss of habitat (IUCN 2007). Some species of antelopes have been tamed and kept as pets, including the gazelle in ancient Egypt and the blackbuck in India. This never resulted in them becoming truly domesticated; for one thing they did not breed well in captivity. In modern times the eland has been bred in captivity and seems to have potential as a domestic animal, providing both meat and milk (Clutton-Brook 1999). Antelopes are also admired for their beauty and each year many tourists travel to Africa to view them. Bere, Rene. 1970. Antelopes. New York: Arco Publishing Company. Huffman, B. 2007. The Ultimate Ungulate Page. Ultimate Ungulate Website. Retrieved February 7, 2007. IUCN Species Survival Commission (IUCN). 2007. 2006 ICUN red list of threatened species. International Union for Conservation of Nature and Natural Resources. Retrieved February 7, 2007. This page was last modified on 3 April 2008, at 17:42.